Rev it up with the all-new 2009 Yu-Gi-Oh! 5D’s TRADING CARD GAME Starter Deck! Featuring monsters and cards seen on the Yu-Gi-Oh! 5D’s animated series, the Starter Deck is ready to kick duels into overdrive! 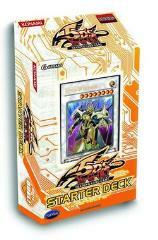 This all-new Starter Deck contains X-Saber cards previously only available through the Yu-Gi-Oh! 5D’s Duel Terminal! Each Starter Deck consists of 40 Common Cards, 3 Foil Cards, 1 Beginner’s Guide and 1 Game Mat. Everything a new Duelist needs, plus nine cards never-before-seen in North America!